My first love was theatre. I saw my first show when I was 5, joined a drama group at 6, attended my first West End production at 7 and the rest is history. Once upon a time, I would spend every waking second listening to musical soundtracks and planning which show I was going to be attending next. I knew every show on the West End and spent every penny on it. However, with growing up, priorities took over and I am no longer up to date with theatreland. With me not living in the country for the majority of the year, I have less time for theatre and haven’t seen a performance in almost two years… teenage me would be appalled! So when I had some free time in London, I thought it was time to rectify this and get my jazz hands ready. Back in the day, I was up to date on what was on the West End at all times but these days I have no clue! So I took to Facebook for recommendations and it came back that 42nd Street would be a good choice. I found a £15 front row seat online and I was sold (literally!). I used to have showtunes on repeat and would often know the words to every song before seeing the production live and because of this, I felt I was going into 42nd Street blind as all I knew about it was that it involved a lot of tap. People weren’t wrong, 42nd Street does involve a lot of tap. I’ve never been a big fan of tap, it’s never really impressed me but that may be because I could never quite get the hang of it myself and was never included in any tap numbers. I’m probably just bitter! However, the tap in this production was stunning. There is something so beautiful about synchronised footwork and I loved every second of it… such talented kids! The fact that this production is performed at Drury Lane which has the largest stage in the West End meant that there was space for a large cast which just enhanced the amazement of the synchronicity. The story itself was light and heartwarming. The movie was released in 1933 during a difficult time in America and provided light hearted relief which was needed at the time. The lightheartedness lives on but when you peel back the layers, there is a lot of depth to the story too. There was always a sexist undertone which felt a little uncomfortable to be watching. I feel though that if the whole Me Too campaign wasn’t current, I would have glossed over the sexist elements but instead, because it has been so big in the media, it really highlighted the dark side of the entertainment industry. However, the sparkle and colour distracted you enough this to see the story as fun instead. 42nd Street is full of glitz and glamour with non-stop enjoyment and an incredibly, talented cast. If you love tap, it is an absolute MUST but even if you aren’t a tap lover, the story and talent will capture you. Some might say that 42nd Street is outdated but I think it deserves its place on the modern West End. It’s lovely that theater has been a part of your life for so long! 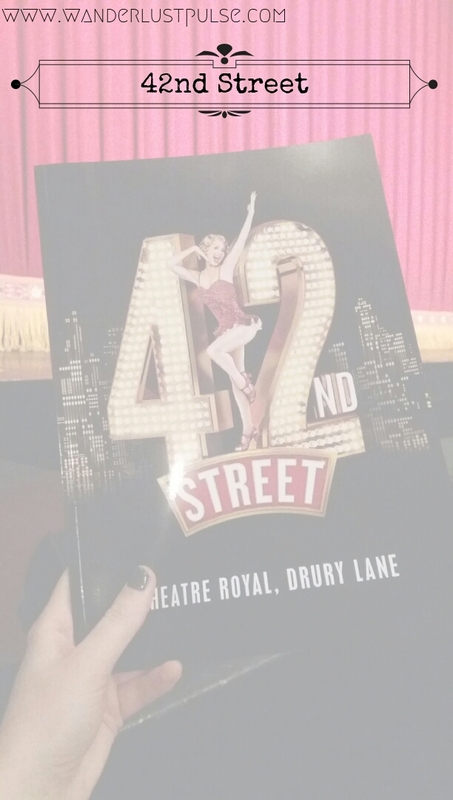 I’ve never seen 42nd Street, nor do I know much about it but like you I adore the theatre! Maybe this is something I should take a look at especially if tickets are as low as £15!? What a bargain! Did you go solo?